Efficient patient flow will increase your healthcare facilities revenue and more importantly keep your patients satisfied and safer. Failing to achieve the right care, at the right time, puts your facility at an operational efficiency deficit. Which in turn places your patients at risk for less than optimum care and potential harm. 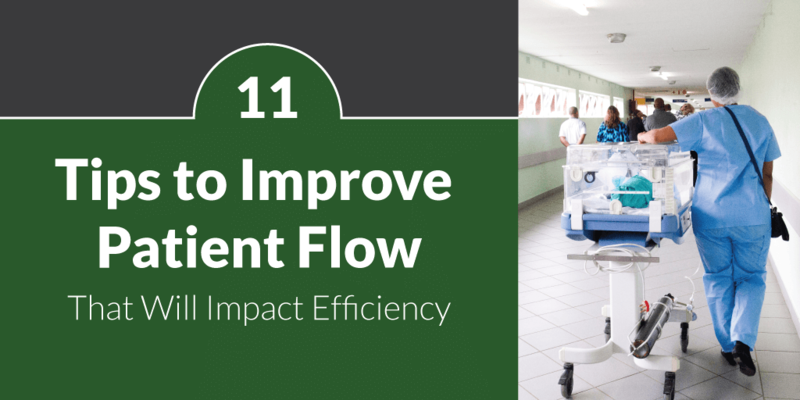 If you're convinced that improved hospital-wide patient flow is good for operational efficiency, make sure to include these 11 guidelines for ensuring better patient flow. When you create a consistent reporting framework between your department heads, with your patients in mind, patient flow will become optimized. As in many healthcare facilities, care is given from one department to the next. This could be from admissions, radiology, surgery and more. As a patient moves from one area to the next, it's imperative all activities are documented from each department. Clinicians can become frustrated when they have no control or insight of the actions taken outside of their immediate department. Hospital culture can impact patient care. Its values, mission and practices must be consistent with all employees. Data reflects there is an interrelationship between safety culture and patient safety improvement. Based on a study conducted from Lesley Curry and colleagues, it was concluded that hospital culture may be positively influenced and that investing in strategies to foster cultures that are supportive of high performance may help hospitals in their efforts to significantly improve clinical outcomes. Keeping in line with the findings above, the approach taken by senior managers and leaders does appear to matter. It can potentially add to the risk of harm when departments heads are not supportive of staff and hospital culture. FierceHealthcare wrote an article on: 5 Ways CEOs can Actually Change Hospital Culture. Jennifer Mensik, PhD, RN, NEA-BC, FACHE, former administrator for nursing and patient care at St. Luke's Health System in Idaho, states "nurse leaders can, to some degree, control the flow of patients and staff accordingly, if they harness unit-level data to find trends and identify how they change staffing and routines to accommodate those trends." She explains to no longer think of staffing as static. Think in terms of how you can plan better given the knowledge at hand with data. When your organization know its capacity constraints and demand patterns it can make changes to align with demand. When both are matched, delays in care can be reduced. For example examine average and peak daily emergency department admissions. Patient flow is attainable when healthcare facilities have the right tools for collaboration and measurement. Care Command Center gives healthcare institutions a needed operational tool. It easily "integrates with your existing systems to facilitate a collaborative environment focused on efficiency, experience and quality. Care Command Center gives everyone in the care continuum the information they need to orient and act." The high visibility with clinician-facing boards allows staff and patients real-time awareness with a HIPAA compliant waiting room whiteboard. The "patient flow standard" (Standard LD.04.03.11) was published by the Joint Commission to help healthcare facilities manage its flow of patients throughout the hospital. The 4-hour time frame referenced in the Standard is a guideline for hospitals to use as a reasonable goal in its boarding time - the time when a patient is held in the emergency department to the time they are admitted or transferred. Using data will help hospitals manage any issues that could affect its emergency department, i.e. patient boarding, which can lead to patient harm and quality of care. University of Utah Hospitals & Clinics was "experiencing long patient wait times prior to admission and patients being held in the ED or PACU for extended periods prior to admission." They wanted to improve the patient experience and remove inefficiencies. Teletracking helped to improve the access to quality care. The bed board process was manual. 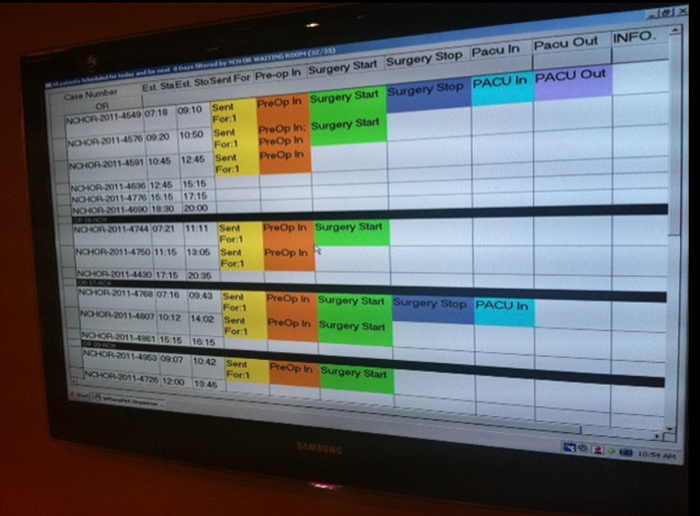 They assisted UUHC by providing as automated tool as a way to revise their patient flow system. This helped with customer and employee satisfaction and discharge rate. The system created transparency in bed availability, status of discharges or transfers, and incoming patients. Modern Healthcare, a leader in healthcare business news, research & data moderated a webinar on the benefits and steps to improve UUHC's patient flow. The full discussion on automating patient flow consisted of the challenges they were facing and the results that followed. One of the most effective skills to have for healthcare professionals is time management. Understanding how to plan and control your time spent on daily tasks is crucial to patient safety. Here are a few tips on time management you can implement today. try and minimize distractions as much as possible. "The survey found nearly half (48 percent) of hospitals have identified or were identifying return on investment models to justify mobile investments demonstrate cost reductions, outcome improvements and staff/patient satisfaction." Tablets can also be used for a better patient experience. Paperwork could be eliminated which will expedite the process. Patient satisfaction is a top priority for health care facilities. According to Dude Solutions, "The maintenance department influences your patient experience, and how you can create a better experience for everyone with awareness and the right tools." Communicate more effectively between your departments - from maintenance, housekeeping and more. A patients' experience and satisfaction can depend largely on a task from the maintenance department. Think lighting, doors or broken equipment. Balancing your workflow will ultimately help your patient flow. A big data trend in the marketplace is the increased use of analytics to advance patient safety. Valuable insights in real time can impact patient care and safety. In our last article, we included an infographic on, 7 Big Data Healthcare Trends. Big Data works on the principle that the more you know about something or event, the more you can gain new insights and make predictions about what will happen in the future. This theory can also be applied to the ability to forecast trends in your healthcare facility. "Neural Networks are a predictive technique that can recognize and learn patterns in data". Advanced analytics will provide better coordination of care, customer service and operations. 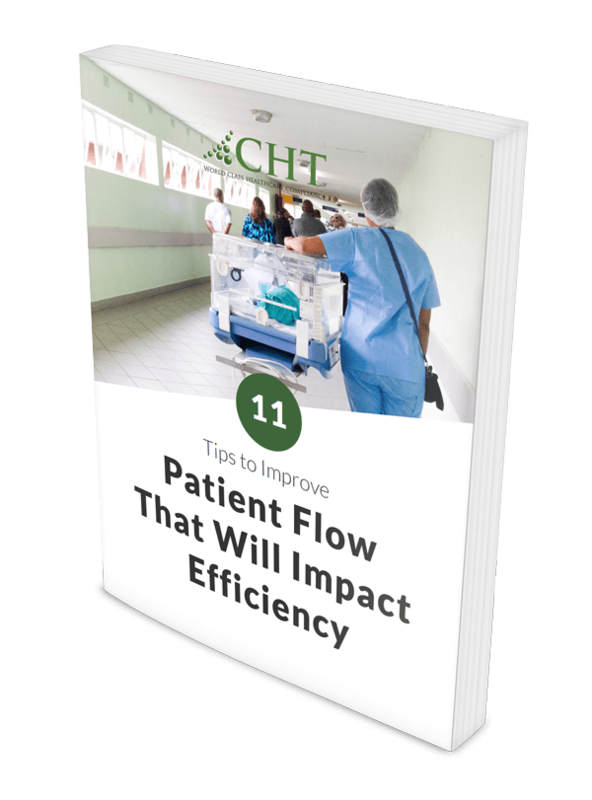 Patient flow is the moving of patients within your healthcare facility. Optimizing patient flow is critical for healthcare facilities for two main reasons - patient safety and quality of care. With technology, hospital leaders are able to generate the statistics administrators desire in real-time. CHT can improve your healthcare facility's cost, productivity and inspection success with their many medical gas services. Medical gas testing, software and inspection will provide you with a safe, cost-efficient hospital.